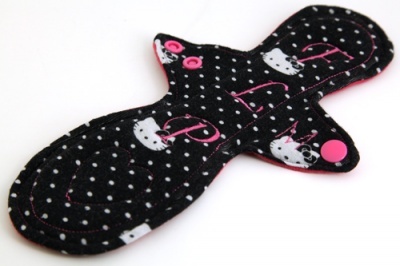 One reusable cloth sanitary pad topped with Cotton Jersey blend. Made in the UK by Fluffy Little Pickles. Choose size and absorbency. Pattern placement will vary. 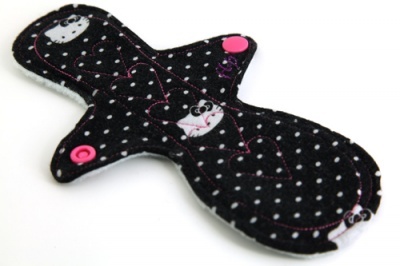 One reusable, washable cloth sanitary pad topped with Cotton Jersey blend. Made in the UK by Fluffy Little Pickles. Choose size and absorbency. Pattern placement will vary. Choose size & absorbency options - 7.5" Liner or 9" Regular Medium pad. Pattern placement will vary. Size: 7.5 inches long and 1.5 inches wide when the wings are snapped across.